Welcome to my eBay Store for UNIQUE ANTIQUES & COLLECTIBLES! Please add to your favorite sellers & shop again to see all the new & clearance items! Thanks for your business, please email me with and questions. We offer fast Priority Mail shipping with insurance on all shipments with 1 day handling! 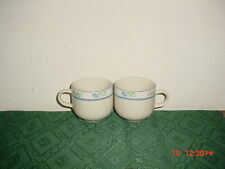 2-PIECE TIENSHAN "WILDFLOWERS" COFFEE CUPS/STAMPED/WHT-PINK-BLU-GRN/CLEARANCE! 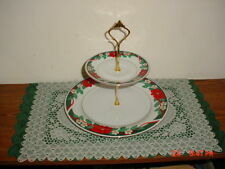 TIENSHAN "DECK THE HALLS" 2-TIER HOLIDAY TIDBIT SERVER/WHT-RED-GRN/FREE SHIP! 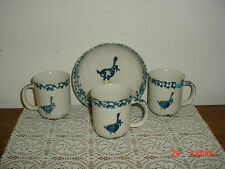 4-PIECE TIENSHAN FOLK CRAFT "GEESE" BLUE SPONGE COFFEE CUPS-BOWL/CLEARANCE! 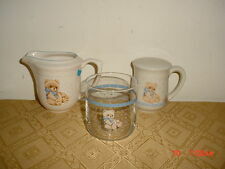 3-PC TIENSHAN "COUNTRY BEAR" GLASS-SHAKER-CREAMER/BEIGE-TAN-BLU/AS IS/FREE SHIP! 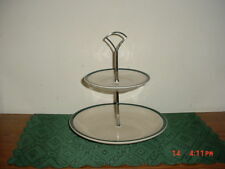 TIENSHAN KITCHEN "BASICS" 2-TIER TIDBIT SERVER/WHT-GRN-BLUE/STONEWARE/FREE SHIP! 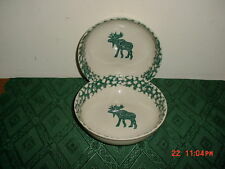 2-PC TIENSHAN FOLK CRAFT "MOOSE COUNTRY" 6 3/4" SOUP BOWLS/CREAM-GRN/STAMPED! 7-PC TIENSHAN STONEWARE "PIG PAL" SAUCERS/RETIRED/CREAM-PINK-BLUE/FREE SHIP! TIENSHAN "DECK THE HALLS" 9 1/4" VEGETABLE BOWL/WHT-RED-GRN-GOLD/FREE SHIP! TIENSHAN "DECK THE HALLS" 12 1/4" VEGETABLE-SERVING BOWL/WHT-RED-GRN/FREE SHIP! 4-PC TIENSHAN FOLK CRAFT 6 3/8" GREEN SPONGE "APPLE" SAUCERS/STAMPED/FREE SHIP! 4-PC TIENSHAN INTRO "ORCHARD" 6 1/2" SAUCERS/STONEWARE/FRUIT-VARIOUS/FREE SHIP! 8-PC TIENSHAN "DECK THE HALLS" COFFEE CUPS & SAUCERS/WHT-RED-GRN-GOLD/FREE SHIP! 4-PC TIENSHAN "PRIMA ROSA" 7 3/4" MEDIUM SALAD PLATES/#2208/FLORAL/FREE SHIP! 4-PC TIENSHAN "DECK THE HALLS" LRG COFFEE MUGS/10oz/WHT-RED-GOLD/NEW/FREE SHIP! 4-PC TIENSHAN "MAGNOLIA" 8" SALAD-SERVING PLATES/FLORAL/STONEWARE/FREE SHIP! TIENSHAN "DECK THE HALLS" LARGE 14 3/8" OVAL PLATTER/WHT-RED-GRN-GOLD/FREE SHIP! 3-PC TIENSHAN "MAGNOLIA" 8" SALAD PLATES/FLORAL/STONEWARE/FINE CHINA/FREE SHIP! TIENSHAN "BASIC COLORS" LRG 12 1/2" ROUND SERVING PLATTER/GRN-BLU-CRM/FREE SHIP! 14-PC TIENSHAN "PEACHTREE" DINNERWARE SET/WHT-PEACH-GRN-BLU/STAMPED/FREE SHIP! 4-PC TIENSHAN FOLK CRAFT 7 1/2" BLUE SPONGE "HEARTS" SALAD PLATES/FREE SHIP! 8-PIECE TIENSHAN "DECK THE HALLS" COFFEE CUPS & SAUCERS/WHT-RED-GRN/FREE SHIP! 3-PC TIENSHAN "POINSETTIA RIBBONS" 5 1/2" DRINKING GLASSES/RED-GRN/FREE SHIP! 3-PC TIENSHAN "STANDARD SEEDS" GREEN BEAN 7 7/8" SALAD-SERVING PLATES/FREE SHIP! 4-PC TIENSHAN "DECK THE HALLS" MEDIUM 7 1/2" SALAD PLATES/WHT-RED-GRN/FREE SHIP! 8-PIECE TIENSHAN "POINSETTIA RIBBONS" CUPS & SAUCERS/WHITE-RED-GRN/FREE SHIP! 2-PC TIENSHAN "DECK THE HALLS" COFFEE POT WITH LID/WHT-RED-GRN-GOLD/FREE SHIP! 2-PC TIENSHAN FOLK CRAFT "MOOSE COUNTRY" 7 3/4" SALAD PLATES/CRM-GRN/FREE SHIP! 6-PC TIENSHAN "FOLK DANCE" COFFEE CUPS & SAUCERS/WHT-BLUE/STONEWARE/FREE SHIP! 5-PC TIENSHAN "MAGNOLIA" 4-COFFEE CUPS & 1-COFFEE MUG/FLORAL/STAMPED/FREE SHIP! 4-PC TIENSHAN "DECK THE HALLS" 10 1/2" DINNER PLATES/WHT-RED-GRN-GOLD/FREE SHIP! 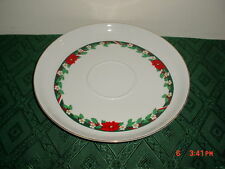 4-PC TIENSHAN "DECK THE HALLS" 7 1/2" SALAD PLATES/WHT-RED-GRN-GOLD/FREE SHIP! 8-PC TIENSHAN KITCHEN "BASIC COLORS" COFFEE CUPS-SAUCERS/GRN-BLUE/FREE SHIP! 4-PIECE TIENSHAN "THEODORE BEAR" 7 5/8" SERVING PLATES/CREAM-BLUE-TAN/CLEARANCE! 4-PC TIENSHAN "WILDFLOWER" 7 3/4" SERVING PLATES/WHT-CREAM-BLUE-PINK/CLEARANCE! 3-PC TIENSHAN "THEODORE BEAR" LRG 10 3/4" DINNER PLATES/CREAM-BLU-TAN/STAMPED! 4-PC TIENSHAN FOLK CRAFT "APPLE" 6 3/8" GREEN SPONGE SAUCERS/STAMPED/FREE SHIP!